These shirts are comfortable and stretchy wicking material to keep you cool and help with quick drying. These are pull-over for easy off and on while still being the best quality athletic fabric. These tri-shorts have a bike pad and are made with a high quality wicking stretch fabric, perfect for any young triathlete that needs a child's size and wants a perfect fit. This race belt actually is made for kids! It is adjustable to git any size waist. Attach your number with ease and NO pins to lose, make holes in your favorite race suit, no wasting time. Use this easy to adjust durable belt for your numbers instead of using safety pins that destroy nice tri-wear with holes and pulls. This can be used time and time again, for all your races. No snaps to lose. These visors are designed with the same great quality wicking material that the tri caps are made with. 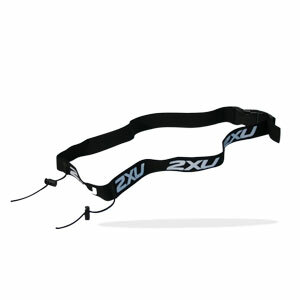 Perfect for any training or triathlon! 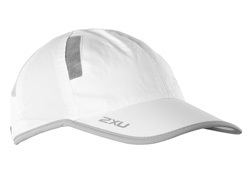 This cool and comfortable hat with a bill has breathable mesh and comes in white only. Adjustable. It has a space in the back for ponytail yet it is totally unisex. The unique parachute material dries quickly and releases heat, keeping the athlete's head dry and cool and gives lts of protection from the harsh sunrays. This suit will fit like a glove, has leg grips and a zip front. The material is fast drying, durable and strong. Flatlock stitching prevednts chafing and the chamois is non-absorbant light weight for comfort and speed. 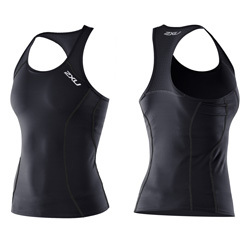 2XU Women Race Tri Suit The perfect race suit from short to any distance triathlons. CONSTRUCTION FEATURES SENSOR MESH Front and side panels for breathability and comfort. SBR SKIN Micro-fiber Polyamide and Lycra Prime Mix SBR SKIN fabric gives excellent stretch memory, working with your body movement, but retaining shape and firmness. REAR POCKET Ergonomic pocket for all your race essentials. FLATLOCK SEAMS FlatLock stitching has low profile for speed through water and comfort against skin. It also stretches along the seam enabling free unrestricted movement. WOMEN TRIATHLON CHAMOIS Italian made lightweight chamois for extra comfort on the bike whilst remaining discreet on the run. This complements the MT1839b. 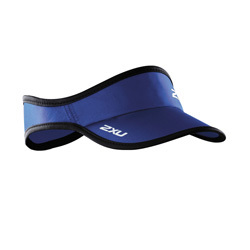 The mesh lining has moisture control with a great ergonomic fit and feel. This singlet is made for speed and endurance. This comp tri-short has 4 pockets for those energy replacements that are a necessity for any athletes's best proformance. The flatlock anti-chafing seams and leg grips are an added essential for this hi-tech proformance short. This active singlet is quick drying and breathable moisture wicking garment made for comfort, good fit and freedom of movement for the most active of triathlete. This cool max fabric has great moisture control and has a non-absorbant chamois for comfort both in and out of the water. This short has flat seams and moisture wicking inner liner. This singlet fits as a full top, made with flatlock seams for anti-chafing and comfort as well as durable.You'll love the fit and feel of the mesh lining with moisture control with support and an ergonomic fit. The neckline has a streamline fit, good in water and on land. This is a padded triathlon short that is known for its excellent fit. 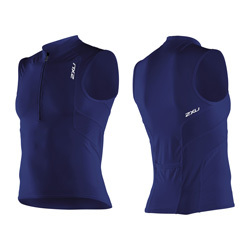 It is a top quality 2XU product known for good fit, comfort and looks, made of a durable, mesh lining moisture control fabric and non-absorbant shamois. The anti-chafing flat-lock stitching is used throughout. This is a fitted bra type top with the most comfortable, fast drying speed top to help any triathlete feel and do her BEST! This top has a great wicking effect to keep sweat moving to the outside of the garment. These shorts have the same high quality non-absorbant shamois along with all the latest technology in moisture control fiber and flatlock anti-chafe seams for comfort, great look and style. The leg grip is bmade to prevent riding up on those long swim, bike and run events.